Angelz Funtime is a comprehensive educational school for children 2 through 12 years old, based on the observation of children’s needs in a variety of cultures all around the world. Angelz Funtime environment contains specially designed materials for development, that invite children to engage in learning activities of their own. Under the guidance of a trained teachers, children in our classrooms learn by making discoveries with our programs, cultivating concentration, motivation, self-discipline, and the love for learning. To provide the best education and daycare, preparing our children for public and private elementary schools when they enter first grade. The teachers and directors of Angelz Funtime firmly believe in a sound education in a safe and loving environment. We realize our children are still young and need to have fun and feel safe at school. School should be a positive and happy experience and lessons should be interesting. The curricula used to teach the children are designed with emphasis on age appropriate lessons. 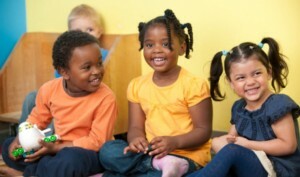 Programs provide opportunities for children to practice self-control, taking turns and sharing. Learning is accomplished in a variety of ways that are designed to appeal and excite them.